Heat dutch oven on coals for Frying. Slice the bacon into small pieces. Peel and cut onions into 1/8ths and break them apart. Peel spuds and slice into 1/4 inch thick slices. Dump the bacon in the dutch oven and stir until about half cooked. Spread the bacon evenly over the bottom of the dutch oven. Spread the onions on the bacon. Pour the spuds on the onions. Shake quite a bit of salt and pepper on top. Cover and Bake at 350 degrees for about 40 minutes. The bacon grease in the bottom should keep things from burning, but it's fine to check if you're getting antsy. The spuds are done when they are tender to a fork. 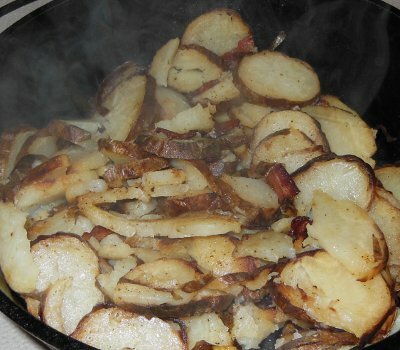 Don't make more than 6 servings in one dutch oven or there will be too much to cook well. Let me know how you enjoyed your Bacon Spuds!